While the world adores Sri Lanka for its tea, I will always love it for its local delicacies. Its been a fortnight that I am back from this beautiful beach country and have indulged in the deliciousness of Punjab too, yet my taste-buds have not forgotten the flavors of hoppers, string hoppers, kottu, pol roti, coconut sambol, wood apple shake, and more. Trust me, as I am talking, I am hungry again. We flew to Colombo and decided to explore it first. I reckon one should not overlook the capital on the grounds that it is just another metropolitan city because some of the most fantastic food adventures happen there. In fact, the famous hill towns and the beaches did not have much variety except a handful of recommended places-to-eat but the capital city of Sri Lanka was different. We had the best food in Colombo. On the first evening, we acted touristy and dined at the famous Upali’s by Nawaloka. On the second, we did a local thing by walking around the old parts of Colombo and digging into the street food along the busy streets of Fort Area, Pettah and Galle Face Green. The latter was great fun. 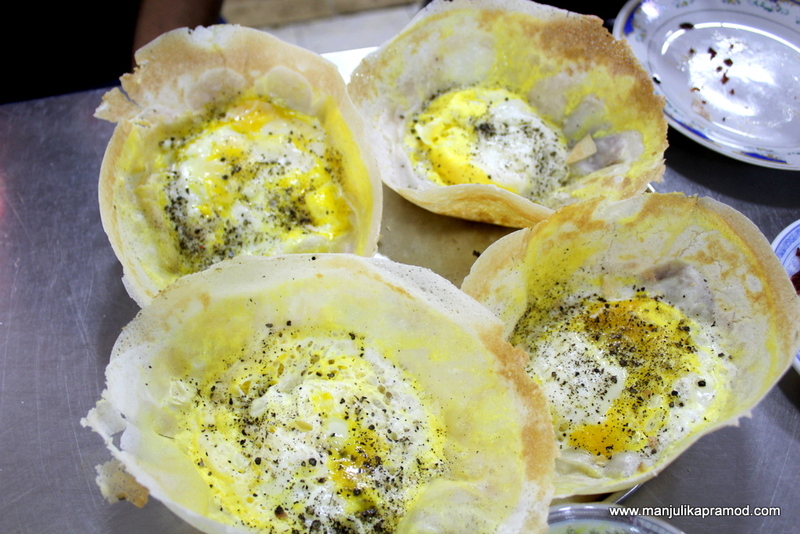 After being introduced to hoppers in Colombo, I wanted to eat egg hoppers almost everyday. Hubby and I fall in the category of great foodies. We like experimenting with the local treats and we believe that one connects to a place through food. We prefer to eat at old, famous places with offer a bit of history too than just the swanky restaurants. While planning our trip to Sri Lanka, we were delighted to read about its great food along the market areas and had made up our mind that we would try most of it. Since we did not know where to start and where to hang out, which shops were better than the rest, which eateries would give us relishing memories, we signed up for a very-very appetizing and engaging food tour – EAT, EAT, REPEAT by Urban Adventures. The online booking was simple. The code was sent on my email and we met our guide near Sir Henry Steel Olcott statue, located in front of Colombo Fort Railway Station. The moment we met our guides at the centrally located and most busy ‘Colombo Fort Railway Station‘, the excitement and thrill of exploring the unseen began. And of course, food was on our minds. We had hardly walked for 100 meters from the fort station when we stopped at a popular eatery. 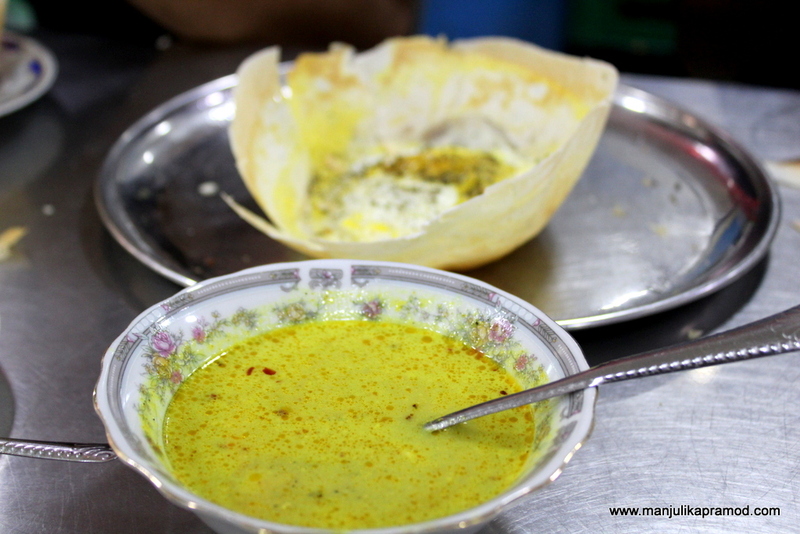 I will always remember it because this is where we ate hoppers and I fell in love with my first Sri Lankan Egg Hopper. There came some Dal, Sambol, dried fish and curry to eat along with it but my complete focus was on the hoppers, which were similar to Apams, a type of pancake made with fermented rice batter and coconut milk in South India. First we ate the simple and plain hoppers and then the egg ones. The bowl-like shape was very interesting. It was sturdy and crunchy enough to hold some curry, cheese, egg and more. I completely relished it and walked towards the live counter to look into its making as well. 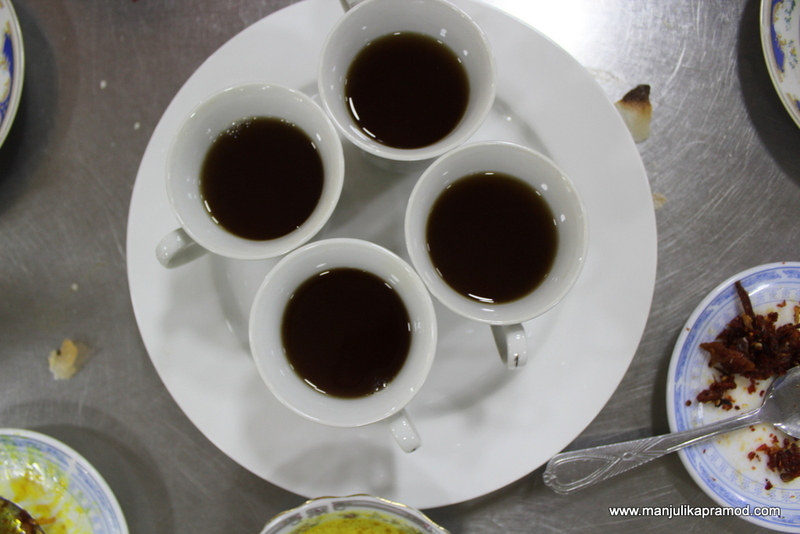 Not to forget, here we tasted local Ceylon tea too and discussed the various types of tea that Sri Lanka was famous for. Our guide also told us about Broken Orange Pekoe (BOP) grade tea, the tea that most of the locals drink in Sri Lanka. The first snacking had already set our mood. Our taste-buds were pepped-up and my tummy was set to entertain more thrills. To reach our next stop, we waded through the visually interesting lanes of Pettah, the whole sale market. This colorful, crowded, bustling shopping market place which captures the heart and soul of old Colombo has played an important role in Sri Lanka’s trading history. In this open market, we found everything from fresh vegetables, meats to cloths, jewelry, electronic goods and more. Our guide had warned us about the porters moving around and we were careful that we did not block their way at any time during the walk. This was most busiest place, (full of locals) that I saw during my 8 days stay in Sri Lanka. I found the vegetable market very interesting as it was fun to learn about the prices as well as see different types of chilies, Tapioca, local Sri Lankan fruits, beans, other veggies and more. Just outside this section, our guide signaled us to stop on the left hand side. 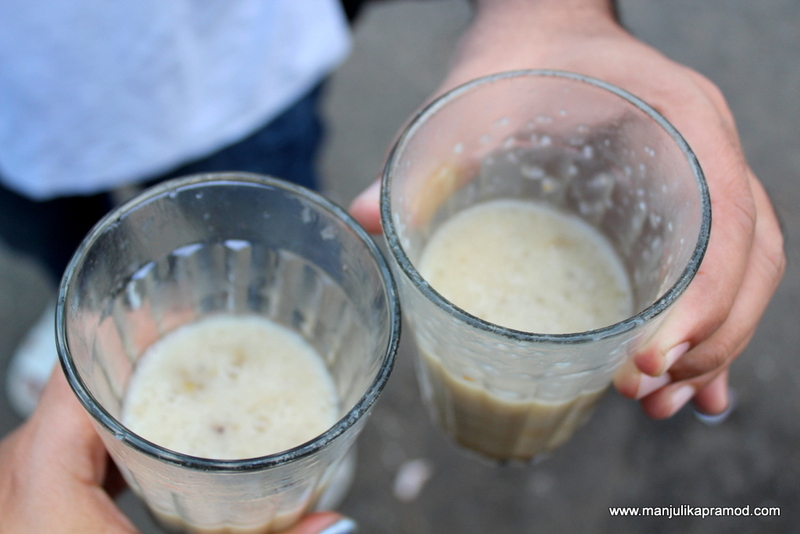 They were about to introduce us with a new drink, Tapioca porridge (Sago pudding), a popular street drink of Sri Lanka. This was indeed different and delicious. It was heavy and satisfying too. I liked its uniqueness and warmth of flavors. Sago porridge which is not eaten but drank in glass. This was unique. As the guides told us about the Pettah market and its history, we walked further until we reached a grams shop. This was almost like a ‘Namkeen shop’ in India where we find all sorts of salted knick-knacks, murukku, crunchy fried bits of flour. The shop where we stopped also had banana chips, tapioca chips, fried lentils, bitter gourd chips,etc. Our guides gave us an option to get one packed for ourselves and we chose our favorite bitter gourd or karela chips. 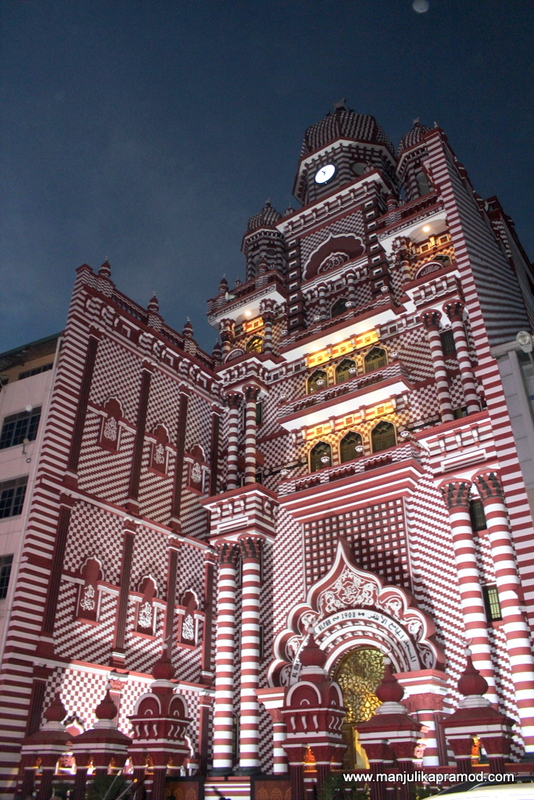 We took a left turn and started walking towards the famous and one-of-its kind, Red Mosque of Colombo but only when we had touched upon some more historic facts around Pettah market. Here we discovered a free standing bell tower, a historical landmark called Kayman’s gate. We learned that it was a very significant junction and used to be the entrance to the former Colombo Fort. Just next to it, we halted for one of the most natural energy drinks, orange coconut also called the king coconut. This was extremely satiating. The king coconut has more electrolytes and carries more water. 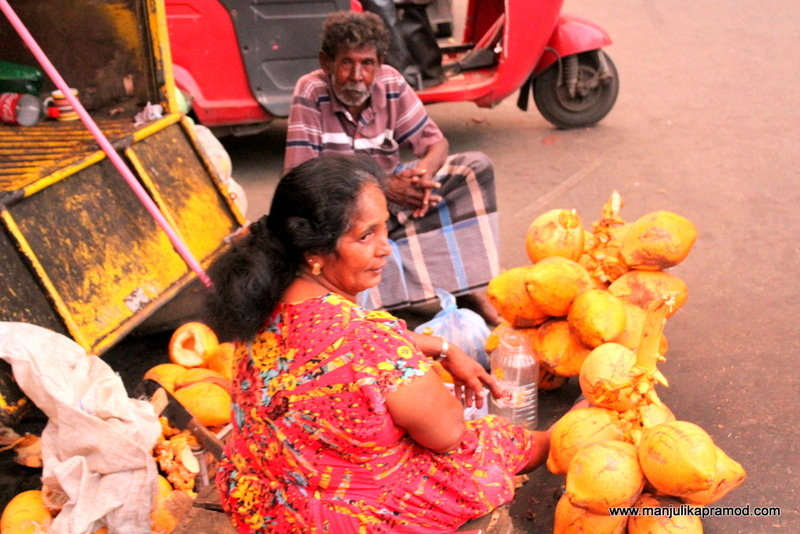 Sri Lanka is the highest producer of king coconut and the locals love to keep their body hydrated with it. They are highly nutritious, fiber-rich and packed with essential vitamins and minerals. Red Mosque, Samosas and Falooda! As the sun came down, the shops on both sides of the street became to glitter with lights. Soon, it became more livelier and chirpy. And there we saw a huge mosque in red. Jami-Ul-Alfar Mosque also known as the ‘Samman Kottu Palli’, ‘Rathu Palliya’, ‘Red Masjid” is beautiful. It was hard not to fall in love with its striking features, checkered minarets and pomegranate shaped domes. I doubt I had seen any other red and white mosque ever. I would have loved to go inside but this wasn’t the appropriate time for visitors. I was disappointed though but soon I was treated to small eats and the famous falooda. Aha, this reminded me of India. 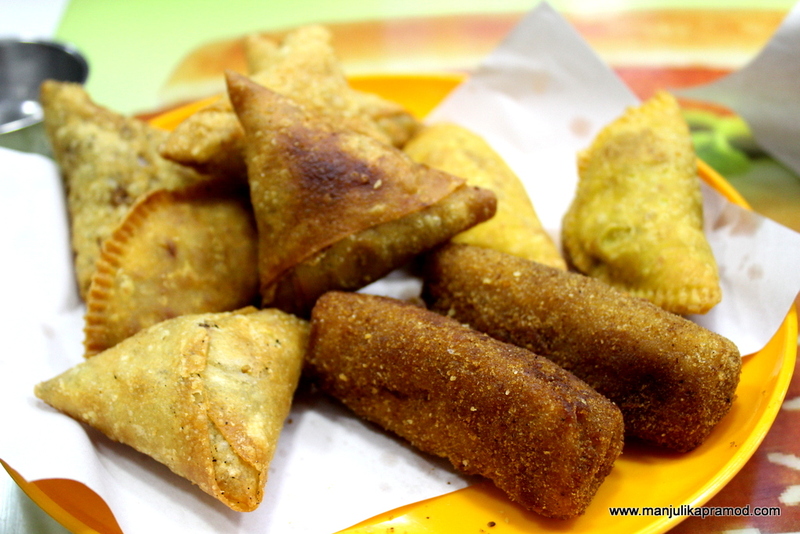 The triangle shaped samosas had chicken fillings in them are a must-eat in Sri Lanka. I was quite full and thus could not manage to taste all. The Falooda drink was deliciously sweet. 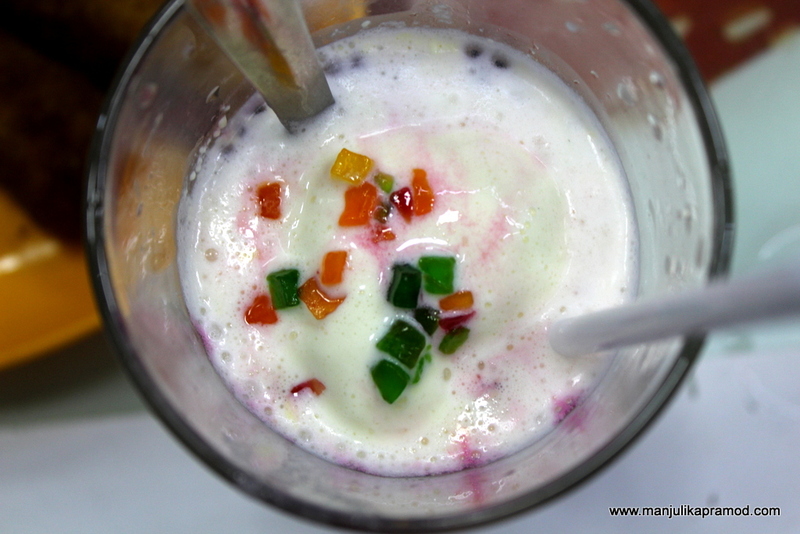 So you will not miss India once you have had this falooda. Sri Lankans love it too and make it just the way we do. 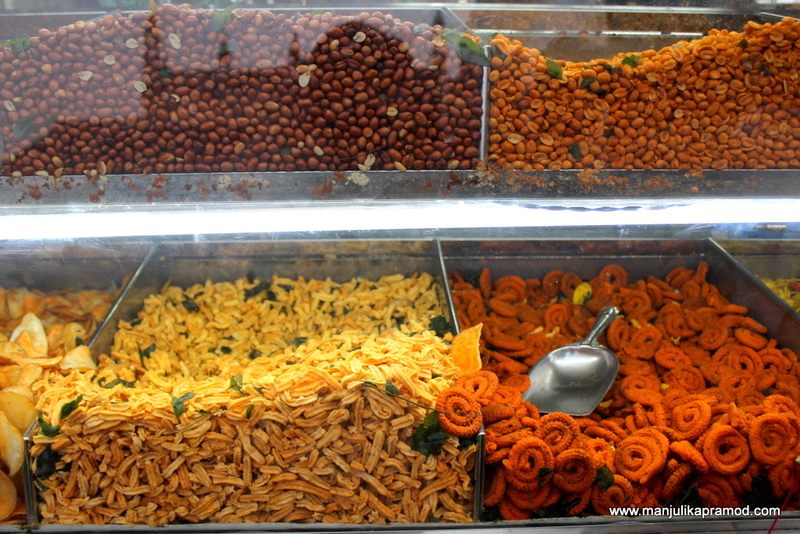 If you love to indulge into spicy pickles of all kinds, Sri Lanka is the place for you. 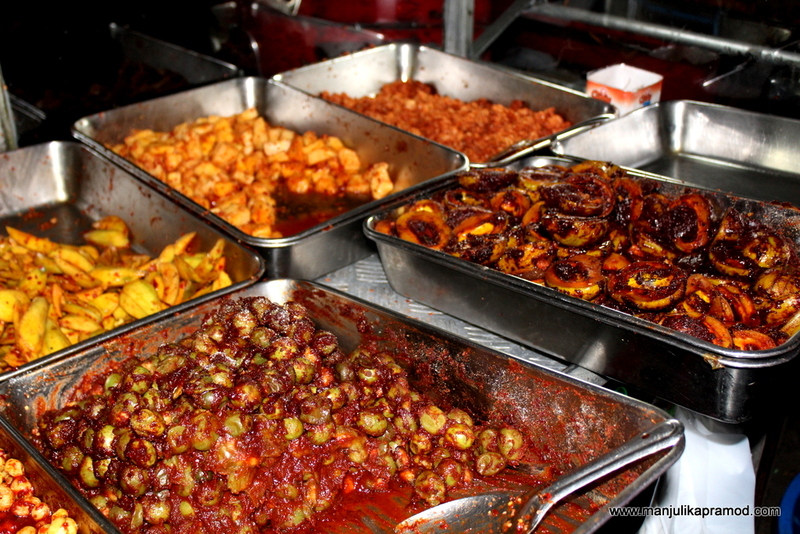 There is a medley of vegetables, fruits and condiments prepared in different tangy and zingy flavors. We were guided to a pickle cart just opposite to the Khan Clock Tower which famously marks the entrance of Pettah. We had entered the Pettah market from the other side. The walking had still not helped to digest all that we had eaten and therefore we did not taste but got it packed. In fact, we ate it late at night in the hotel room and totally loved it. The pineapple pickle was amazing. From here we proceeded to the colonial, old, historic as well as swankier side of Colombo. The aim was to walk to the side of Galle Face Green where locals as well as tourists enjoyed some amazing views of the sunset, almost everyday. The walk till the Nana’s, an open air eatery at the Galle Face Green gave me a chance to understand history of Sri Lanka, walk through its glorious past and get fascinated with lot of hotels and food carts. We passed through many historical and old buildings that were built by Dutch, Portuguese and British. There were many which had stood through decades and there were others which had been damaged and rebuilt. We came across a number of five-star hotels of Colombo too. Suddenly the roads became wide and huge. The crowded patches became lesser and lesser. And the informal turned into posh and plush. The walk not only gave a peek into the local life but it also introduced us to some of the Sri Lankan landmarks like the harbour, the Grand Oriental Hotel, the Cargills building and the Old Colombo Dutch Hospital. This is where I saw food vendor carts selling orange isso vadei. Even though, I did not taste, it was easy to make out its preparation. Lentil cakes topped with prawns looked very interesting but since I am allergic to sea food, I kept away from taking a bite. Finally we sat down to eat at Nana’s. 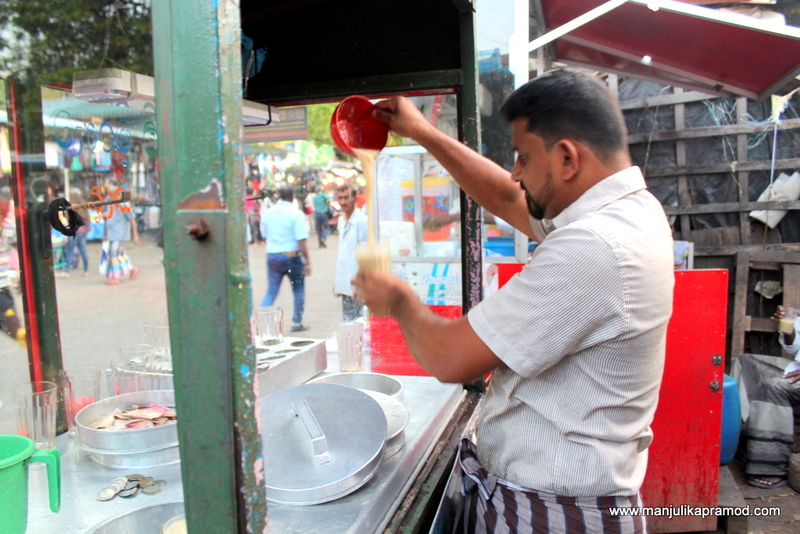 Our guides were quick to order Egg Parantha and Koththu Rotti or Kothu Roti, a famous Sri Lankan dish from its street food variety. 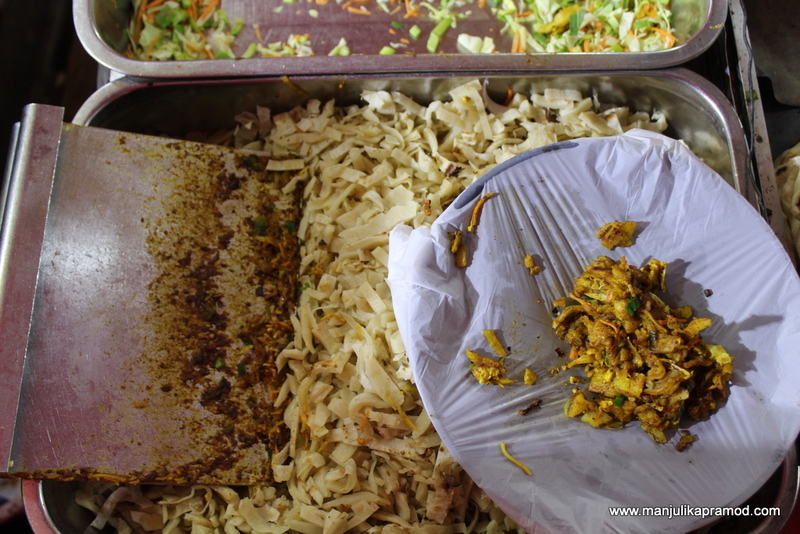 This is basically made of shredded or chopped roti which is cooked with veggies, egg or chicken. The final product is bang on. You can’t do by eating Kothhu only once, you have to keep eating in all the places that you visit. The taste keeps changing as per the area but the basic way of making is the same. I would definitely recommend this culinary trail for two reasons. 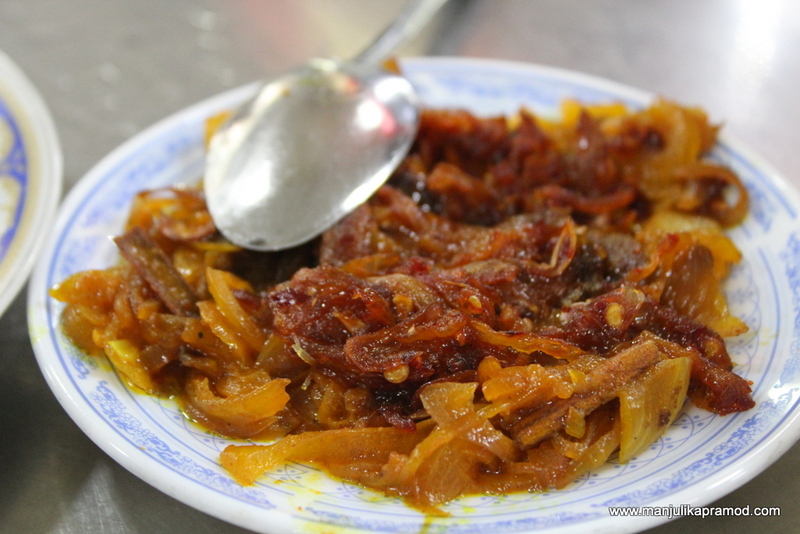 Firstly, it gave us a hang of the Sri Lankan local life, history, heritage of one of its oldest market and second it prepared our taste buds for the rest of the trip. 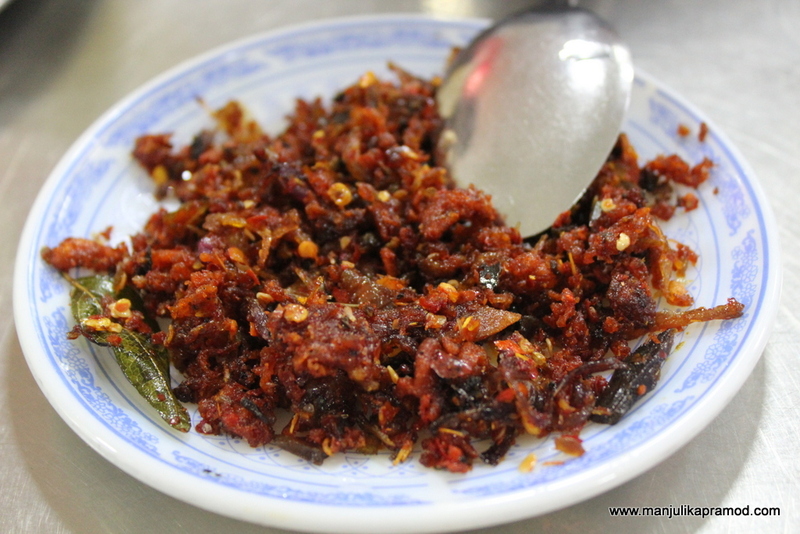 For the next 6 days, we knew what we wanted to eat, what a good egg hopper or a kottu tasted like. Another important thing is that we were guided to eat only at tried and tested as well as comparatively hygienic places and thus had no tummy upsets. Local guidance is always good. Sometimes I wonder if Sri Lanka is an extension of India? I have heard the landscape too resembles the coffee and tea plantations of the South along with the coconut trees. Enjoyed reading your posts, Manjulika! You seem to have enjoyed your culinary tour of Sri Lanka. I wonder if the hoppers will become the next global egg phenomenon. Maybe you can integrate them with avocado somehow! I really liked your photo of the Red Mosque in Columbo. You capture the imposing nature of the building really well! Bravo! This was such an interesting read! I consider myself a foodie, but I had no idea Sri Lanka had this amazing, varied, different cuisine! I would love to try a lot of these dishes! Funnily enough, the little car with fried flour snacks reminded me of the street cars in Mexico. They also sell crisps and other fried things to entretain your tummy! Food tours and culinary walks sound so fun. I’m definitely interested in doing one some day. The Hoppers look yummy, and the Red Mosque would be a wonderful landmark to photograph! Oh my god these Hoppers look DELICIOUS. I’m honestly drooling. I had never heard of them before, but they are so high on my MUST EAT list now! Thank you for introducing me to Sri Lankan food! Every time I travel to a new city the first thing I do is research a food tour or a cooking class. I looked at your photos and read the description of the dishes and got hungry, even if I just had lunch. Everything looks so delicious and yummy! I never had tapioca porridge and I find it very interesting on how it is served, in a glass to drink and not to eat from a bowl. 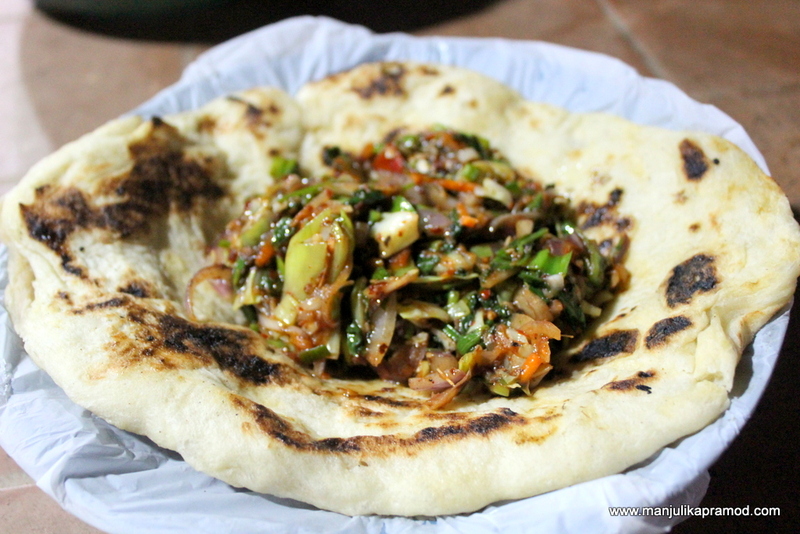 I would love to try the Kotthu, it looks like the perfect street food type of food to finish the tour with. It’s a shame i have neighbour been to our friendly neighbour. The food looks great there. I had never heard about Orange isso vadei before. Looks delicious.